Machinists Union members are proud to build and maintain the state-of-the-art planes, helicopters, ships and other military equipment that keep our service men and women safe. We are also honored to work on military bases across the country. Many IAM members are veterans themselves. 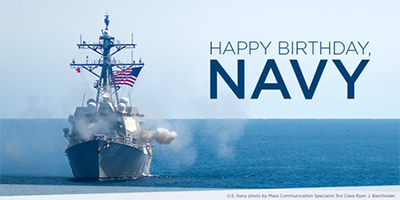 This Saturday, October 13, we salute the U.S. Navy for 243 years of defending our nation. Are you an IAM member who is a veteran of the U.S. or Canadian military? The IAM Veteran Services Department is here to help.